I am currently watching Kill Bill 1. I haven’t seen this movie in a while. The action scenes= awesome! Anyways. I know haven’t posted in a while. Maybe it’s because I have lost motivation in updating the blog and not having as many hits. I’ve decided to try and let it not get to me. I’ll continue to post about writing and everything else. It’s been about a month since I’ve gotten out of school and I am jobless. Sitting in my parents’ house, just cleaning. It’s really annoying, it’s not like I want to sit at home. I really am trying for a job. The other day I dropped off applications in various places and went to Barnes & Noble. Yes, I got myself a book, despite being on a summer budget. 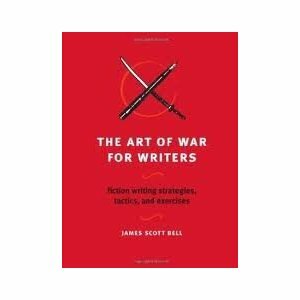 The book is titled The Art of War for Writers by James Scott Bell. The book was priced around 15 dollars; I’m sure on Amazon.com you can find it cheaper. Successfully starting and finishing a publishable novel is often like fighting a series of battles. You not only have to work hard to shape memorable characters, develop gripping plots, and craft dazzling dialogue, but you also have to fight against self-doubts and fears. And then there’s the challenge of learning to navigate the ever-changing publishing industry……You’ll find tactics and strategies for idea generation and development, character building, plotting, drafting, querying and submitting, dealing with rejection, coping with unrealistic expectations, and much more. I have only read the first part but I find the book, so far, to be motivational. I think that it was what I needed to get over my writing block or the lack of motivation. There are great quotes and small activities to do that are more on the list side. I am excited to read Part 2 and Part 3. I’ve also decided to wait to post one of my stories. Until then, write on! Posted in Book, Writing and tagged art of war, book, James Scott Bell, novel, novels, write, writers. Bookmark the permalink.